Starting a story is daunting and many of us who write struggle to find enough hours in the week to go deep into a narrative. As I embark on a new novel, three quick ways I use to keep me in the game felt like ones I should share. Find Your Passion, or Embrace the Pain. I know, sounds like a massively tall order, but you need fuel for the journey. If it’s not something you think about constantly, then I wouldn’t pursue it. 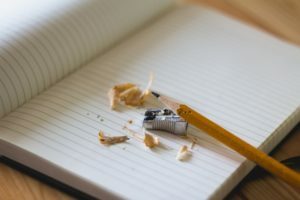 Whether it’s a cool idea that keeps flooding your brain, a meltdown you’re having about politics, or a personal situation that keeps you up at night, it is the perfect source to keep you writing. Motivation. My test is this: if I can talk with friends or family about it, I can probably write about it, too. I am good at turning obsessions, anger, revenge, distress into a scene in a novel. Keep Paper Everywhere. I could also say, Keep the Phone Nearby and Use Your Notes app, but the moment I tap my phone, notifications from Facebook/Tumblr/Messages flood my view and I am off down a rabbit hole before I realize it. Blank sheets of paper have inspired me since childhood. Seeing blank space gets me jazzed to fill it. So when an idea strikes at an inconvenient time, like when I’m driving or tumbling into bed, I have the blank sheet nearby giving my brain a little jolt to Jot it down, jot it down! before I forget. Because I will. I always do! Gather Up These Notes and Head to the Computer. If I do one thing, it’s get rid of one of those notes in the pile every day. I tap in something, somewhere. It could be in one of three documents I start: the Character Profiles (a stream-of-consciousness study of each major player in my story–thank you, Elizabeth George, for that tip), the Synopsis (my outline following Blake Snyder’s Save the Cat principles and beats of a story), or the Manuscript (first draft). The idea gets dumped somewhere so it’s not lost. So even if I don’t write a full scene or even a paragraph today, I have done Something. And believing you have accomplished Something lets me move forward with some confidence in unmapped territory. This is how we do it. Idea by Idea, piece of paper by piece of paper, line by line.